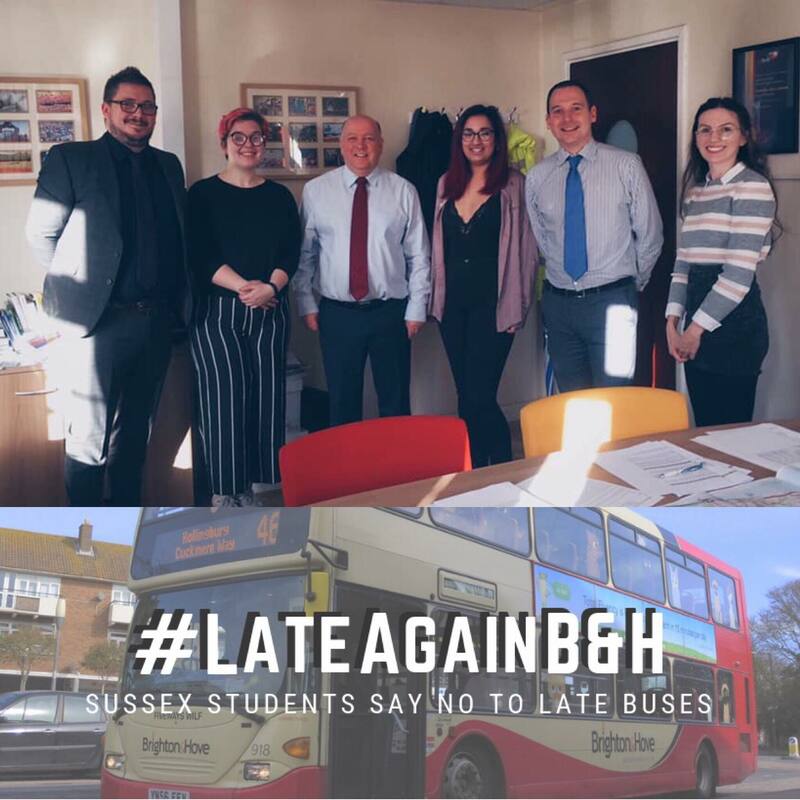 This edition I have followed-up with the ‘Late Again’ Campaign after recent developments in the team’s pursuit of a punctual and reliable bus service that cater for the demands of students in terms of its timings and reach across Brighton and other popular student locations. As the picture suggests, the ‘Late Again’ team were victorious in their primary negotiations with the company. After a couple of meetings the statement was released stating that new amendments to bus times would be introduced, as well as new bus routes being trialled as soon as April. Not only were they successful in enacting change throughout the bus company, but they sparked inspiration from their peers as they were nominated for a Student Award as well. The ‘Late Again’ team really devoted their time and effort to this cause as they did everything from media coverage to postcard campaigning. The initiative and persistence they showed as they campaigned, taking in the opinions, ideas and experiences of the wider-community of Brighton, across platforms, really exhibits the excellence and devotion that gained them yet another rewarding achievement. I spoke to the team themselves for a statement on the recent successes and they were quick to remind me that the fight doesn’t stop here…. Anushka: If other students are thinking about making a change in the university or the wider community they should go for it! We are only 3 students, with the help of Frida, and we have managed to get a whole range of improvements made for students who take the bus to uni. We did a lot of our campaigning online and this allowed us to be really flexible with other commitments. Social media is a great tool for change! Irem: I could add Anushka’s comment that they shouldn’t be afraid of giving it a shot and raising their voices. We’ve come a long way from where we began to this point. We started with nothing and accomplished so much in just 5 months. I feel very lucky to have helped improve the quality of student life at Sussex University. But I also feel extremely lucky to have met 3 amazing women who are very passionate, fun, lovely and supportive. You never know when or where your path is going to cross with good people. So, if there is anyone out there thinking some things need to change or thinking of being a part of campaign, they should go for it. This summarises in its entirety, the community and spirit that comes with getting involved. The hard work accomplished here is evident, but the reward gained proves to be just as great. Is there something that you wish to change within the university? Take inspiration and take action like the ‘Late Again’ team, and don’t wait for others to change things for you.